This modern 3 bedroom semi-detached villa is located in a quiet cul-de-sac in the village of Mesa Chorio, which enjoys both the charms of the typical Cypriot village and tranquil rural setting, with the convenience of Paphos town which is a few minute’s drive away. The property in Mesa Chorio benefits from breath-taking elevated and unobstructed panoramic sea views and is designed on three levels. On the ground level is a gated driveway with paved garden and covered car port to the front, which can be easily enclosed to make a garage if required. To the left of the entrance foyer is a large utility room and patio doors straight ahead open on to a private covered terrace and fully fitted shower room. On the first floor is a spacious living room including lounge/dining area and guest cloakroom to the side. An attractive archway plus separate access door leads through to a huge kitchen with space for a second dining area or sitting room/office. A balcony to the rear provides useful outdoor storage space. The living room faces the front of the property and has patio doors providing easy access to two separate balconies to the front and side of the property, both with fantastic panoramic sea views. The second floor features three spacious double size bedrooms with fitted wardrobes, a modern family bathroom and ensuite shower room. The master bedroom like the lounge below has access via patio windows to front and side balconies with stunning views. There is a tiled communal pool with roman steps to the side of the property which is very well maintained and the surrounding terrace is bordered by a variety of colorful plants and trees. 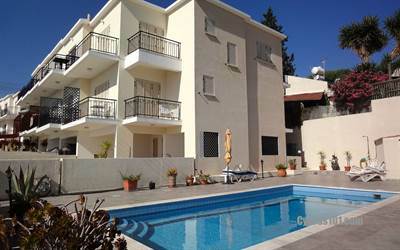 This property in Mesa Chorio is ideal as a permanent residence or holiday home and has full title deeds. Please refer to MLS#: 647 when inquiring.